Video technology in sport has been at the forefront of a lot of discussions over the years. Some find that the negatives far out way the positives, with matches taking that bit longer due to video referrals, whilst some also believe that some match officials rely so much on the technology that they struggle to make their own decisions unaided. The belief is generally held though, that although there are improvements still to be made, it can only be seen as an advantage as it increases correct decision making and as a result of this players, coaches and fans don’t walk away feeling as hard done by. Goal-line technology (GLT) in football has been implemented to track the position of the ball in relation to the goal line to eliminate incorrect decisions by referees. FIFA have used a variety of GLT providers including GoalControl, GoalRef and Hawk-Eye which use either high speed video camera tracking or magnetic field-based technology. GLT was first used at the 2012 FIFA Club World Cup in Japan and was successfully used during all 64 matches at the 2014 FIFA World Cup in Brazil, leading to the first World Cup goal to be awarded with the support of GLT between France and Honduras. The English Premier League was the first national domestic league to use GLT by implementing Hawk-Eye systems from the 2013/14 season. The use of video referees is a very new thing in football. So far, the only league to trial it has been a third tier American Soccer League. They were given permission by the International Football Association Board to trial their Video Assistant Referee system with the hope of implementing it permanently in 2018. The system is very similar to that used in other sports – it uses an additional referee to review footage and make decisions on game changing incidents. In a game featuring New York Red Bulls II and Orlando City B, two important and successful decisions were made using the technology. In March 2016, the new FIFA president Gianni Infantino stated a trial of the use of video assistant referees for "game-changing decisions" in football will begin no later than the 2017-18 season. He believes greater use of technology within the game is inevitable and called it a "historic" day, with the decision proving the game's leaders were "listening to football". The technology will only be applied to key incidents concerning goals, red cards, mistaken identities and penalties as they do not what to change the flow of the game. Cricket has used Hawk-Eye – a visual ball tracking software – at major Tests, ODIs and Twenty20 matches around the world since 2001. It uses the Smart Replay technology to record all camera feeds and makes them available in real time to enable third umpires to make quick decisions on key incidents such as run outs, stumpings, no-balls and disputed catches and boundaries. Since 2008, the ICC has also used a Leg Before Wicket (LBW) detection system by being able to produce an accurate 3D representation of the path of the ball, using six or more computer-linked television cameras situated around the cricket pitch. This allows the third umpire to adjudicate on LBW decisions that have been referred. In 2008, a Decision Review System (DRS) was also included by the ICC, allowing players to challenge decisions made by the on field umpires and refer to the third umpire and the technology available. In a test match, each team is allocated three unsuccessful challenges per innings to challenge any decision made, however only the batsman on the receiving end of the umpire’s original decision or the captain of the fielding side can appeal for a review. Cricket and it’s use of technology has been under a lot of scrutiny recently as some people believe it is slowing down the game and distracting players and viewers alike. The use of a third umpire also places a large amount of pressure on the umpire as Hawk-Eye in cricket is not as clear cut as tennis and requires adjudication by the third umpire so is consequently open to further errors. A further issue with Hawk-Eye in cricket is the accuracy in predicting the future path of the ball. The predicted path of the ball is based on the average and expected pathway and cannot account for skidding or hitting a crack or bump on the pitch therefore the LBW decisions system may not always be correct. Hockey have been using video referrals since their trials at the 2009 men's Champions Trophy in Melbourne, Australia as a way of reducing umpiring errors. It was then used in the 2010 World Cup in Delhi and has since been used in all international hockey events. In hockey, there are two types of referrals which can be called upon during a match. Either of the two umpires can use the referral system if they are not certain they have made, or are able to make, the correct decision relating to a goal. Each team is also allocated one referral during the match; if this referral is successful, then the team retain the right to refer, however if the referral is not successful they lose this right. Any team member on the pitch has the right to use the referral, however referrals are restricted to decision within the 23 metres area relating to the award or non-award of goals, penalty corners and penalty strokes. As in many other sports, there are concerns that the use of video technology and referrals slow down the game and undermine the umpires, but Carol Metchette – a video umpire – said that as we only allow one referral per game in hockey it keeps teams from referring smaller incidents. The first Grand Slam event to feature Hawk-Eye technology was the 2006 US Open, prior to this it had only been used at the Nasdaq-100 Open in Miami. During a match, each player receives two challenges per set to review line calls. If they believe the ball has incorrectly been given as in or out they can challenge this. Once a challenge has been made, Hawk-Eye is used to trace the path of the ball to show the actual position of it in comparison to the line in question. If they are correct with their challenge they retain it, however if they are incorrect they lose the challenge. Additionally, if the match goes to a tie-break, each player receives one further challenge. The only Grand Slam not to use Hawk-Eye is the French Open. The officials refuse to use it as they believe that the unique characteristics of the clay court do not warrant it as the ball makes a mark on the clay surface. If the umpire was unsure about the call, they can have a look at the mark on the surface. Since 2000, the use of a video referee or TMO (Television Match Official) in rugby has been on the increase. The aim of a TMO is to help referees and assistant referees to ensure accurate and consistent decisions are made on field. The TMOs use video replay technology to assess incidents on specific areas of the game. These include the grounding of the ball for a try, whether players were in touch before grounding the ball, determining whether a kick at goal was successful, confirming if an infringement has occurred in the build up to a try and considering acts of foul play. During the game, the referee is the only person on the field of play who can call on the TMO to assist in a decision being made. The referee is the final decision maker - if they have awarded a try they have until the conversion is taken to consult the TMO. If the TMO finds a reason to not give the try, the referee can disallow the previously awarded try. At the 2015 Rugby World Cup, TMOs could use Hawk-Eye video replay technology for the first time at a major rugby competition. This enhancement in technology allowed TMOs to view multiple angles synchronised in real-time, slow motion replays and increase zoom functionality to strengthen the accuracy and efficiency of their decision making. Hawk-Eye video technology was also used to aid support for medics when identifying and reviewing head impacts. There has been a huge amount of discussion based on the use of TMOs in rugby over the years. Many people say that the use of TMOs has become too familiar and disrupts the flow of the game. The referees no longer stick to their decisions and consequently do not trust in their own abilities. Many fans think that TMOs should only be used in the act of scoring and not for other infringements during a game. The worry is that fans are beginning to turn their back on the sport as the technology that was originally brought into the game to improve the viewership could be causing the opposite. The video referee in Rugby League was first seen at the 1996 Super League World Nine. The Super League were then the first league to use a video referee consistently in 1997 and the National Rugby League (NRL) quickly adopted its use in 1998. A video referee in Rugby League is very similar to that of Rugby Union as they can be called upon to examine the play leading up to a try and the grounding of the ball. Additionally, in Rugby League they can be called upon to check the success of a 40-20 kick and at any point during a game when a stoppage has occurred. As with Rugby Union, they also do not have the right to overturn a referee’s decision once it has been made. In a recent development by the NRL, a video referee bunker will be used to speed up decision making and hopefully reduce errors by the current video referee system. The NRL believe the bunker will reduce errors and speed up decisions as it allows the video referees to call upon multiple camera angles themselves and have access to the playback control rather than relying on broadcasters. The video referee will have a touchscreen interface with zoom features and split screens to further enhance their decision making. This new video bunker will first be used in the 2016 season and is based off sight at NEP Australia at Australian Technology Park in Eveleigh. In general, as in many other sports, there are a large number of people who feel that the use of video referees in Rugby League ‘ruins’ and slows down the game. However, others believe that it allows for a more exciting match as wingers are far more acrobatic when scoring as they know they no longer have to rely on the referee’s real time perception of their try scoring attempt. Since 2002 the NBA has used instant replays to confirm or change the initial decision made by the referee. In the 2002-2003 season instant replay was only used to automatically review shots taken at the end of each quarter and to review all fouls that occurred with no time remaining on the clock. Initially it was not used at any other point during the match, however since its debut in 2002 instant replay has been used for more things over the years. Since the 2007 – 2008 season, referees have been able to review all play altercations automatically that include two or more players that are engaged in a fight or an interaction that is not part of normal basketball, or a player being ejected from the game due to performing a hostile or reckless act against another player. During the 2008 – 2009 season, instant replay was used to review clock malfunctions and attempt to determine the amount of time that has passed and how long should be left on the clock. Also in the 2008 – 2009 season, referees were able to review all situations in which officials are not reasonably certain whether a successful field goal was scored correctly as a 2-point or 3-point field goal or, in the case of a called shooting foul, whether the player was attempting a 2-point or 3-point field goal. In the 2009 – 2010 season, referees were able to initiate a review if there was doubt present as to which player caused the ball to go out in the last two minutes of the fourth quarter and during overtime. Additionally, in the 2009 – 2010 season, referees could review depending on if they were not reasonably certain whether the player had made the basket within the 24-second clock. 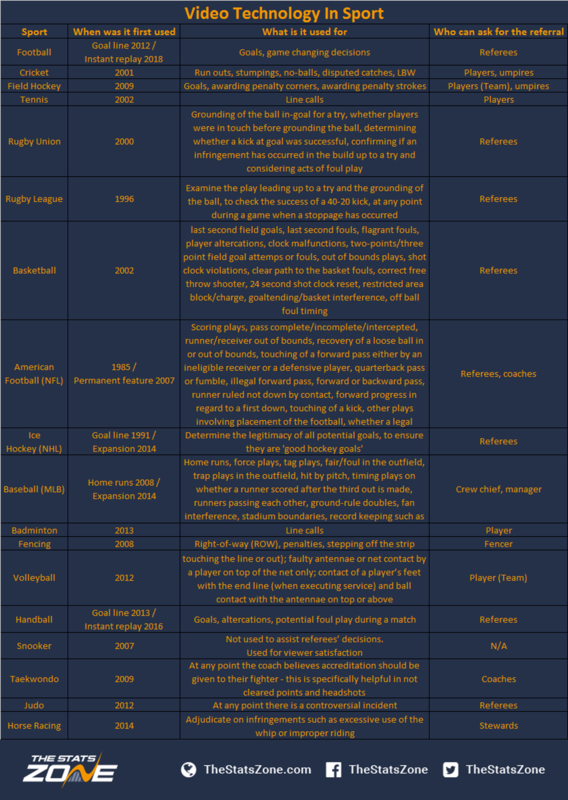 Review of clear path to the basket fouls, correct free throw shooter and 24-second shot clock reset were added in the 2010 – 2011 season. More recently in the 2012 – 2013 season, an automatic review of all flagrant fouls was added and finally, in the 2013 – 2014 season, off ball foul timings were reviewed by the referee in situations where they were not reasonably certain whether a player without the ball was fouled prior to (a) his teammate beginning his shooting motion on a successful basket or (b) his teammate releasing the ball on a throw-in. Now not only has the NBA been adding reviewable situations over the years, they have developed their own replay centre to improve the quality of camera angles and reduce the time taken for all referee reviews. This review centre was first used in the 2015 – 2016 season with great success. Reviews will still be triggered by the officials on the court, but once those plays are marked for review, the NBA official referees in the replay center officials will relay the administration of the call. The NFL were one of the pioneers in using instant replay technology in sport, as they used a replay official to monitor the game feed from within the stadium in 1985. These replay officials were not called upon as they are today, they were the person who initiated all reviews, however they were only able to review a call with indisputable visual evidence. This pioneering technology was not to be used for long as after being used for six seasons, 17 owners voted against renewing the system in 1991 due to the system delaying the game and reliability of correct calls. Between 1991 and 1999, many adjustments were made to the replay system, including coaches being able to challenge calls and allowing referees the authority to review plays on the field inside a booth equipped with monitors, however it was not until owners voted in favour of the technology in 1999 that instant replay reviews were back in the NFL. This system allowed coaches two reviews per half and would only charge them a timeout if their challenge was incorrect and therefore unsuccessful. Replay assistants were also implemented to initiate all reviews inside the final two minutes of each half to allow coaches to focus at the end of each half on which plays to call and not which calls to challenge. Continual changes and amendments were made between 1999 and 2004, including a reward system for coaches that were successful on their first two reviews – they received a third challenge. In 2004, the NFL also extended the use of the replay system for another five seasons with the hope of someday making it a permanent feature. This became a reality when in 2007 when 30 owners voted in favour and instant replay became a permanent feature in the NFL. Instant replay technology now plays a huge part in the NFL, and following the 2014 season all decisions are now made in a specific review centre based at the New York headquarters. In many sports fans, coaches and players are in dispute as to whether the use of instant replays improves the game, however many in America Football state that the system may not be perfect but it has improved dramatically over the years and definitely allows the referees to make rulings correctly and consistently. The NHL was also quick to utilize video review in 1991. It was implemented in an effort to resolve any questionable goals being awarded. Up until recently, this was one of the only uses Ice Hockey had for its video review. In 2013, the NHL created a situation room which is very similar to that of the NFL – it allowed all games and video reviews to be monitored in one location. In 2014, the NHL announced the expansion of the video review allowing video technology to assist the referees in determining the legitimacy of all potential goals, to ensure they are 'good hockey goals'. This expansion and new rule allows the referees to not only review whether the goal was successful or not, but increases the array of situations where video review clearly establishes that a "goal" or "no goal" call on the ice has been made in error. In a further development, the NHL has chosen to use Hawk-Eye smart replay technology, and has placed Hawk-Eye cameras in all of its arenas. Starting in the 2015 – 2016 season, the video goal judge with the use of Hawk-Eye replay can review replays of disputed goals when requested to do so by the referees and review replays of disputed goals when they observe an incident that was undetected by on-ice officials. After viewing the replay, the video goal judge will promptly tell his decision directly to the referee at the penalty bench. When a play has been referred to the Video Goal Judge, his decision shall be final. No goal may be awarded (or disallowed) as a result of video review once the puck has been dropped and play has resumed. Also in the 2015 – 2016 season, all coaches were given a challenge; if the coach wants to use their challenge they must have one time out remaining as if they are incorrect and the decision stands the team lose their only timeout, however if they are correct and the call is changed they retain their time out. Baseball has used instant replay technology since 2008 for the decisions of home runs, however it wasn’t until all 30 clubs of the Major League Baseball (MLB) unanimously approved the expansion of the instant replay for the 2014 season that other elements of the game could be reviewed. Based on the 2014 expansion, each club will receive two Manager Challenges to start each All-Star Game, postseason game and Divisional or Wild Card tie-breaker game, and one Manager Challenge to start every other game. If the manager uses a challenge and the call is overturned they get to keep their challenge, yet if they are wrong their challenge is lost. There is a slight difference when it comes to baseball, as even when a manager may be out of challenges there may be a chance the umpire will grant a request in the last three innings. At any time during a game, a Crew Chief may initiate a Replay Review of a potential home run call. A team that has used all of its challenges may request a replay review, however they cannot insist. A minimum of seven cameras are used to show different angles to the umpire after a challenge is made, and they also have access to any replays from the networks covering the game. Managers can challenge umpire’s decisions about force plays, tag plays, fair/foul in the outfield, trap plays in the outfield, hit by pitch, timing plays on whether a runner scored after the third out is made, runners passing each other, ground-rule doubles, fan interference, stadium boundaries and record keeping such as the count and numbers of outs. All of these options for challenge cover 90 percent of all potential situations during a match. In June 2013, badminton first used a new instant review system at the OSIM BWF World Super Series tour at the Indonesia Open. It was only used on specific camera enabled courts yet was a significant development within the sport. It allowed all players two chances per match to challenge the umpire’s line calls. If their challenge was incorrect and the umpire’s decision stood, the player or pair would lose a challenge, however if they were correct the player or pair would retain their challenge. The player or pair must clearly state their challenge by raising their hand/arm immediately after the shuttle has landed and the line call made, and no later than the commencing of the serve for the next rally. A further development within badminton was in April 2014, when the BWF contracted Hawk-Eye to provide the instant-review system at the MetLife BWF World Super Series tournament in New Delhi and for all BWF Major Events. This allowed badminton to develop and begin to show graphics that many people are accustomed to in tennis. The International Fencing Federation (FIE) included a video replay system for the first time at the 2008 Beijing Olympics and it has been used since. The FIE state that the video replay system will make fencing fairer and more transparent. Fencers both start with two replay requests and they are the only person allowed to ask for a replay. As in many other sports, if the call stands it uses up one of their requests, however if the call changes the fencer keeps the request. If the fencer is incorrect twice they are no longer allowed to challenge. In a team match each fencer gets one replay request for each bout. They can ask for a replay regarding right-of-way (ROW), penalties, stepping off the strip, etc. In Volleyball, the video challenge system was first used at an FIVB event during the FIVB Volleyball Club World Championships in 2012, however it was not until 2014 that the 12-camera system was put in place for the 2014 FIVB Volleyball Women's World Championship in Italy. During a match, teams can call for a video verification of a referee’s decision twice per set. However, they can only challenge the referee’s decision in specific situations, including ball position when touching the floor (was the ball in, touching the line or out); faulty antennae or net contact by a player on top of the net only; contact of a player’s feet with the end line (when executing service) and ball contact with the antennae on top or above. The only member of the team who is able to call for a video verification is the coach. They have five seconds after the rally has finished to challenge the decision to the first referee. If they are successful and the incorrect decision is overturned, the team do not lose the challenge, however if the referee’s decision stays, the team lose that challenge. As the teams are allocated two challenges per set, the FIVB have stated that if the request is judged by the 1st referee as inconsistent with challengeable matter, the request will be rejected and the requesting team will be sanctioned for game delay. Goal line technology was first used in handball at the Velux EHF Final4 in 2013. It uses multiple cameras fixed to the goal to check if the ball has crossed the line. If the referee decides the goal line technology is needed, the clock is paused and one referee views an instant replay at the technical support table to make a decision. In handball, the use of both the instant replay and goal-line technology is exclusively the responsibility of the referees and only the referees can decide to make use of it or not. No player, coach or EHF member of staff can appeal to use these technologies. Once a decision has been made by the referee using either of these technologies, their decision is as factual as if they had made the decision without. Hawk-Eye Broadcast Enhancement in snooker is used to show viewers intended shots when the actual shot has gone awry or the view from a player, specifically when in a potential snooker situation. This is different to other sports as it is not used to assist referees’ decisions, it is used for viewer satisfaction. The BBC first used Hawk-Eye at the World Snooker Championship 2007 and now uses it every world championship as well as some other major tournaments. Competitive martial arts have had a number of questionable decisions made by judges over the years; One of the more recent and controversial being Sarah Stevenson being eliminated during the Beijing Olympics when a scoring shot was not counted by judges. Following her dismissal, she appealed against the decision and with the use of video replays the decision was reversed and she went on to win a Bronze. This pushed the governing body to create a new image of taekwondo and a cleaner competition by introducing an instant video replay system to minimize the number of judges and errors committed by their judgement. It was first used at the 2009 World Taekwondo Championships which took place in Copenhagen, Denmark and continued to be used at subsequent competitions, including the London 2012 Olympics. Coaches have cards which they are allowed to raise during the fight when they think some accreditation should be given to its fighter – this is specifically helpful in not cleared points and headshots. Another sport that has suffered from incorrect judging decisions and scandals in the past is Judo. In an attempt to eradicate these scandals from the sport, instant video replays were used for the first time at the London 2012 Olympics. At any point during a bout, if there is a controversial incident the referee can refer to the refereeing commission who use video replays to make a clear decision. The use of this technology can decide whether points should be awarded and can determine the outcome of the bout. Other than using video technology to determine winners during a photo finish, horse racing is not the most likely sport to use video technology during a race, however they have started to use Hawk-Eye video replays. The video replays are used to enable the stewards to quickly and accurately adjudicate on infringements such as excessive use of the whip or improper riding.